Education World camped out last night with kids and their parents as they awaited this morning's 12:01 release of Harry Potter and the Goblet of Fire. But Harrry Potter Fever extends beyond the books! Included: Learn about a special Harry Potter summer reading program created by one librarian and about some of the latest Harry Potter Web sites! MADISON, CONNECTICUT (July 8, 2000) - The movie was over. The crowd that had seen The Patriot had gone off in different directions. But this town's normally sleepy Main Street was still bustling. A police car's lights flashed a blue strobe over the scene. TV news crews hovered nearby. And a crowd of a few hundred people had gathered across the street from the moviehouse. Why the crowd so late on a Friday night? Why so many people under four feet tall? The answer could be found inside R.J. Julia Booksellers, where Roxanne Coady and her staff were making final preparations to open the store's doors at 11:00 p.m. for the hottest event of the year. The guest list for this long-planned bash included a veritable who's-who of young readers and their families. The kids, many dressed in wizard caps and black-rimmed glasses, were wide awake in eager anticipation of the 12:01 a.m. release of Harry Potter and the Goblet of Fire, the latest volume in the saga by British author J.K Rowling. Inside the store, storyteller Nancy Bochin was getting ready to read from the newest Harry Potter book. Soon Bochin would be surrounded by dozens of youngsters listening hypnotically -- as if under the spell of Harry or one of his peers at Hogwarts School of Witchcraft and Wizardry -- as she read a pre-midnight preview of chapters 3 and 4. Rowling is one of Bochin's favorite authors to read aloud to children. "She writes characters who are three-dimensional to the extent that I can hear their voices," she said fondly. "Harry, for example, has a sweet, clean, honest voice. Kids and adults alike chatted excitedly as they salivated over their reserved copies of the book stacked by cash registers inside the store. "I have my flashlight in the car so I can start reading on my way home!" said a seven-year-old Potter fan as he stood in line. Another mother and daughter debated about which of them would be the first to read the book. What is it that has kids and their parents so wild about Harry? "It's not boring," said one young girl dressed in a black cape emblazoned with gold stars. "It has magic and adventure and mystery," said a boy standing nearby. Why are kids -- and adults -- wild about Harry? How do you explain it? Add your thoughts to today's message board. "Rowling fleshes out her characters, she uses rich language, her plots are intricate," Bochin told Education World. "She takes no shortcuts in her writing. She gives her readers credit for having intelligence and an attention span." Suddenly, a young chorus of "10-9-8" counted down to the appointed hour. Skinny arms finally raised their copies of the 752-page book in a victorious salute to the power of Potter. "It's heavy" and "Let's go home so I can read!" were a couple of the comments heard as families headed happily for the exits. "I've never seen anything like this," said Coady after the release of the book. As of closing time, the store had sold nearly 600 copies of the book. A handful of orphaned parents standing on the sidewalk in front of the store chatted in agreement. "This is so cool," one parent told Education World. "Anything that gets my son this excited about reading gets me excited too." "The great thing is that Harry Potter appeals to boys and girls alike," said a middle-age dad of three. "When I was a kid I read the Hardy Boys and my sister read Nancy Drew. All the kids love Harry Potter." "It's wonderful to see kids so interested in reading," said Susan Polk, manager of the bookstore. "It's a 750 page book and they still want it that much. That's exciting!" See additional Web sites related to Harry Potter at the end of this article. Bookstore owners had to sign affidavits that prevented them from selling the book until today, Polk explained. There is no release date set for the fifth book in the seven-book series, she added, though she anticipates a release "sometime next year." Meanwhile, Harry Potter and the Sorcerer's Stone, the first book in the series, has been on the New York Times Best-Sellers List for 80 weeks. In anticipation of the demand for volume 4, Scholastic, the U.S. publisher of the series, planned the biggest first printing of a book -- 3.8 million copies -- in trade book publishing history. Richard Robinson, chairman of Scholastic, compared the book to classics such as "Alice in Wonderland." "It's about children battling for themselves and for good in a world of good and evil," he told the New York Times last week. "It's the classic story of a young person thrust into a world of danger." POTTER SPAWNS SUMMER READING FUN! This summer, librarians at the Henry Carter Hull Library in nearby Clinton are capitalizing on Harry Potter fever. Children's librarian Lynne Hidek created this summer's reading program around a Harry Potter theme. The centerpiece of the program is a Harry Potter game board. Kids track their summer reading progress, assistance librarian Helen Houpert expalined. For every 15 minutes of summer reading time, a child age seven or younger earns a turn at the game board's spinner; kids over age seven earn a spin for every 30 minutes of reading time. The first youngsters to complete the game earned free passes to a local amusement park, a minor league baseball game, or another similar event.. Each time a reader completes a trip around the game board, his or her name is entered in special raffles. And each week, participants get to grab a prize from the library's Magic Cauldron. In addition, the library has planned many special summertime events tied to Harry Potter. Those events include a magic show, a visit from an owl expert, and a "magic potions" show in which kids get to observe and participate in science experiments of a chemistry nature. "Our summer reading program is always very well received," Houpert told Education World. "The number of books checked out this June is a little ahead of the number checked out last June (1999)." But Houpert stopped short of crediting Harry Potter for the rise in those numbers. "Many children are reading much more than they did five years ago," she said. 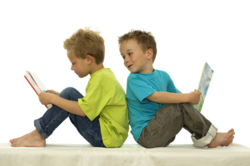 "Today parents understand more the importance, no the necessity, of reading." ADDITIONAL RESOURCES: HARRY POTTER WEB SITES! Following are a selection of Web sites devoted to the Harry Potter phenomenon. New Web sites are always popping up, so this is not by any means a definitive listing!